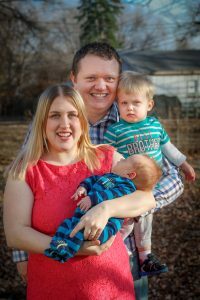 For the past fourteen years, Jonathan & Theresa Baldwin have served at the International House of Prayer in Kansas City. In 2014, they brought their lives and ministries together and were married. Since then, their family has grown with the additions of Jeremiah and Caleb. Now as a family, they are serving in the inner city helping to build a prayer room and see a neighborhood with the highest crime rate in Kansas City transformed with the the power of the Gospel. In addition, they have passion to fight abortion and see a culture of LIFE prevail in our nation. They also have a deep love for the people of Haiti regularly taking part in missions and strategic initiatives in that nation. Their passion is to spend their lives building and strengthening the house of prayer to send out laborers until every nation hears of Jesus’ love.